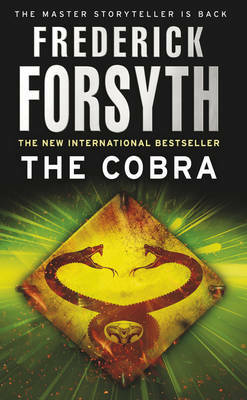 The superb latest novel from this very experienced author once again tackles an unexpected subject that other thriller writers are not considering and this unique quality is the factor that keeps Forsyth ahead of the competition. This book opens with the tragic death of a young man from over-indulgence in cocaine. The American President hears of this and is profoundly effected as in his youth the American leader shared many of the young man's personal circumstances. Although he is not identified by name the physical description of the President in this story and the name of his wife points unmistakeably to Barack Obama. The President decides that the way the US criminal system classifies cocaine is wrong and that it should henceforth think of the people who import and sell this dangerous drug as terrorists and deal with them accordingly. He asks for an ex-CIA special operative Paul Devereaux to come out of retirement and head up the special task force that will be charged with eradication of the cocaine industry completely. Devereaux, whilst in the CIA, was known by the nickname of "The Cobra" and this continues in this new role. The Cobra asks for a 2-billion dollar budget and gets it and after a detailed examination of the problem he realises that to attempt to eradicate the drug at its source. and 60% comes from Colombia, would be futile. He decides that to stop the drug barons is the only way to achieve success, and they must control and end their distribution networks. As he has unlimited funds, men and resources to help him he sets up ships, planes and other arrangements that this author describes with incredible detail. Devereaux the Cobra appoints several lieutenants for special tasks which he cannot do himself and one of these is Cal Dexter who was formerly a paid bounty hunter and is made Devereaux's second in command. Forsyth shows that with improved technology the opportunity for the desperate to carry cocaine secreted in plastic balloons in the stomach is quickly disappearing with the introduction of more efficient X-ray machines in airports. So the cartels are using other methods and bringing cocaine to market in boats including submarines and aeroplanes. With these latter methods much more can be carried than using smuggling alone. Cal Dexter, buys especially equipped ships and aeroplanes to combat the smugglers and huge quantities of drugs are intercepted and destroyed. The Cobra has a special arrangement that all the other agencies, be they the CIA, DEA, FBI etc., should pass any information they obtain about anti-narcotics to Project Cobra. I enjoyed this novel very much and once started had difficulty in putting it down until the conclusion was reached. This author never ceases to amaze me with the thoughtful choices of subjects that he writes about. The detail the author goes into is amazing and is testament to the huge quantity of research that this former investigative journalist underwent before writing a single word.